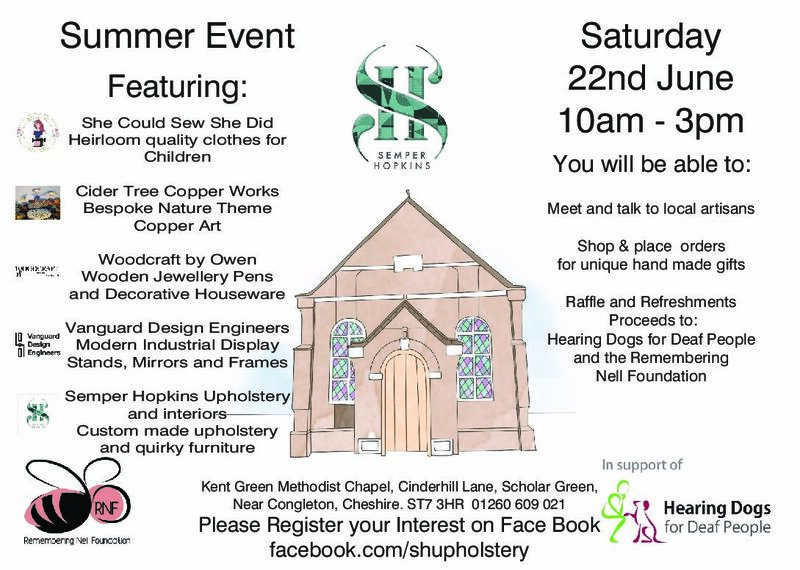 On Saturday 22nd June 2019 we will hosting a Summer event from our workshop Kent Green Chapel in Scholar Green, Cheshire. We are looking forward to meeting up with old friends & clients and meeting new people who want to see and experience what we do. It’s an opportunity to meet us, ask us questions, get expert advice and see the furniture that we make. Enjoy refreshments and partake in the raffle with proceeds going to two well deserving charities Remembering Nell Foundation and Hearing Dogs for the Deaf People. If you loved hand crafted products come and pay a visit. We have invited four local artisan businesses. Treat yourself to something or buy a special gift for a loved one. If you have a spare hour feel free to pop-in we would love you to come and join us.